In every occasion there is a perfect flower to suit! Send flowers for any occasions from Bundles of Flowers. Our flower in a bouquet arrangement are comes from farm fresh flower arranged by professional florist. We offers a wide range of Funeral Flowers same day delivery along Metro Manila and will make sure that the funeral flowers would be delivered on day, on time. Inaugural flower arrangement with beautiful floral in a stand which is widely used for grand opening ceremonies. 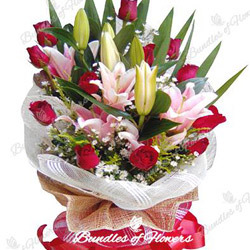 Bundles of flowers is an online flower delivery or online flower shop in the Philippines, located in Quezon City. We provides affordable and inexpensive flower bouquets, flower vase, flower in a basket, customize flower arrangement, birthday flowers, flowers for all occassions, and flower gift ideas. We offered inaugural flower stand; flower for inaugurations which is widely used for grand opening ceremonies for business such as; opening shops, restaurant, salon, new opening bank, and groceries store. And we offered sympathy flowers and funeral flowers to express affection, sending condolences to the family of a deceased individual. We also have wide array of unique flower arrangement designed by the local florist. So if you want to send flowers to your loved one, Bundles of Flowers is recommended to you. You can browse and select flowers through visiting our online flower shop for your convenience. SAME DAY FLOWER DELIVERY We also offer same day flower delivery services with 100% satisfaction guarantee within Metro Manila, Quezon City, Makati, Manila, Pasig, San Juan, Mandaluyong, Taguig, Pasig, Marikina, Caloocan, Las Pinas, Valenzuela, Paranaque, Navotas, Muntinlupa, and Malabon. Our aim is to deliver your flowers within any time of the day. FREE FLOWER DELIVERY You do not need to go outside your home to buy fresh flowers to your loved one because people these days prefer buying things online than method of going into stores. 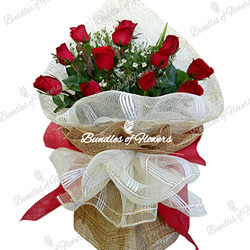 Bundles of flowers offers free flower delivery within selected areas in Manila. Like the other online flower shop, we offer different kind of flower arrangement in different occasions such as; Valentine’s Flowers, Mother’s day Flowers, Father’s Day, Birthday Flower, Anniversary Flower, Inaugural Flowers, Just Because Flowers, Get Well Gifts, Wedding Flower Arrangement, and Sympathy and Funeral Flowers. What are you looking for? GET FREE shipping on flower delivery at Bundles of Flowers today. You may browser and select our beautiful and unique bouquets by visiting our online flower shop. 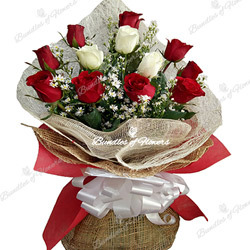 1 Dozen Elegant Red And white 9 pcs red roses and 3pcs white roses arranged in a bouquet. 1 Dozen Red Roses 1 doz red roses arranged in a bouquet. 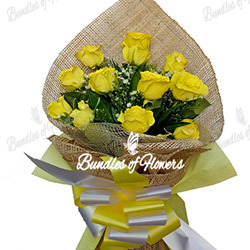 1 Dozen Yellow Roses 12 pcs long stemmed yellow roses arranged in a bouquet Note: Roses spray yellow paint color only. Mothers Day Flowers 07 1 dozen red roses and 3 pieces stargazers in a bouquet.